﻿ ﻿ ﻿ ﻿ Cycle of Change: change promoter or benevolent fiction? Cycle of Change: change promoter or benevolent fiction? Prochaska and DiClemente’s ubiquitous ‘five stages of change’ seems to offer a scientific system to guide clinicians and therapists on how to work with patients – how to recognise when someone is ready to commit to treatment (or if not to nudge them towards a more receptive stage), and how to avoid wasteful change attempts with those not yet ready to change. Implicitly or explicitly, in services across the UK this system is used to recognise the motivational state of patients and clarify how to promote progression to sustained recovery. Its simplicity is beguiling, but can it really be used to generate change by matching patients to interventions, or does it simply describe one type of change process? The stages of change are the “most eye-catching” aspects of a ‘transtheoretical’ model of behavioural change, originally based on a comparison of ‘self-changers’ versus those in professional smoking-cessation treatment. Testing and applications of the model later extended to a range of other health-related behaviours including substance use, cancer screening, and HIV/AIDS prevention, but today smoking still accounts for the bulk of studies. “The first stage, pre-contemplation, designates individuals who are not thinking about performing the behaviour in question and are not sufficiently aware of the health implications of their actions. 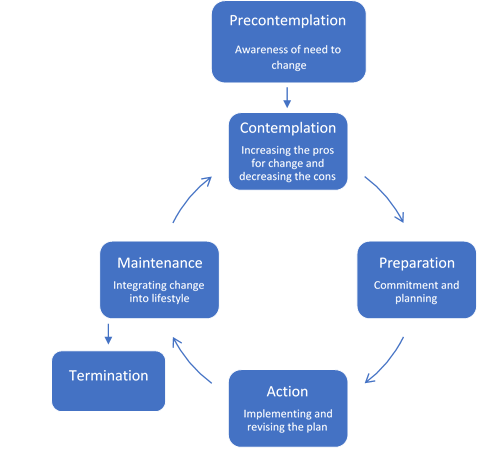 The second stage is labelled contemplation, the stage at which persons start to think seriously about changing their behaviour, but have not yet acted. The third stage is called preparation and is characterized by people preparing themselves and their social world for a change in their behaviour. When individuals successfully and consistently perform the behaviour in question, they are regarded as being in the action stage. Progression from the action stage to the maintenance stage occurs when the behaviour in question has been performed for six months or more” (emphasis added). Embedded within this explanation of relapse are the other “relatively neglected” features of the transtheoretical model – the mechanisms that explain how people navigate change. These are known as the ten processes of change, decisional balance, and self-efficacy. Studies have reportedly shown that use of the processes of change has helped and encouraged smokers to quit, employees with low socio-economic status to engage in more physical activity, and members of the public to consume less alcohol. When behavioural change is intentional, ‘cycle of change’ and derivative models offer a detailed and possibly valid description. But what of when a smoker suddenly becomes disgusted with their smoking, spits out the cigarette half way through, dumps the remnants of the packet in a bin, and never turns back as if something had overtaken them? Intentional change is not the only or it seems the most robust way people initiate change. For smoking in particular, it may be a minority route, and one half as likely to ‘stick’ as unplanned attempts. Perhaps in less florid manifestations, that also seems a common kind of experience among dependent drinkers in treatment in Britain. When asked what they thought had helped them overcome their dependence on alcohol, patients in the UK Alcohol Treatment Trial (UKATT) commonly described revelatory moments which precipitated wholesale transitions in how they saw drinking, and in their determination to change. As with smoking, in these situations half-finished bottles can simply be poured down the sink or thrown away in disgust. That doesn’t mean unplanned abandonment of substance use is without causes; at the time, the desperate Wilson was ripe for such an experience. But whatever led up to this, at the moment of change immediate causes can take the form of triggers which precipitate change rather than a weighing up of the pros and cons. Another UK survey – which again found unplanned stop-smoking attempts twice as likely to succeed as planned – discovered unplanned attempts were commonly triggered by health advice/concerns, expense, and pressure from family/friends, though 1 in 6 respondents could cite no particular reason. In California, a survey of problem drinkers found that weighing the pros and cons of drinking as a reason for cutting down was much less likely to lead to lasting remission than ‘conversion’ experiences like hitting rock bottom, a traumatic event, or experiencing a religious or spiritual awakening. And among young people participating in a trial of a Dutch motivational intervention, spending too long in the contemplative stage may have done more harm than good – in this case, more talking and thinking about cannabis (eg, focusing on reasons not to change) without an accompanying rapid nudge to action and a strategy for dealing with ambivalence, was associated with more rather than less cannabis use. A ‘natural fit’ with mutual aid and group therapy? Exemplifying its versatility, the stages of change model has been extrapolated from individual therapy and self-change to non-professional mutual aid and group therapy. Though specific connections have yet to be made in the literature between ‘12-step’ recovery and the stages of change model, the “natural fit between the progression and expectations of behavioral changes” found in both may seem evident. Describing how they complement each other in practice, one paper listed engagement with 12-steps (specifically Alcoholics Anonymous) alongside each of the five stages, arguing that the combination could help treatment providers with client assessment, case formulation, treatment planning, and treatment implementation, and help clients with their progression through treatment (unfold supplementary text). • Precontemplation stage: Alcoholics Anonymous (AA) literature could be useful in informing the client about the consequences of drinking. A measurable sign for the clinician that the client is progressing through the precontemplation stage is the client’s conversation with sober members of AA and the awareness of days and times of local meetings. • Contemplation stage: Clients can become stuck in a struggle between the costs and benefits of changing, creating profound ambivalence. This is similar to AA’s step three (of 12), deciding between a problematic life of continued drinking and seeking out a spiritually based solution. From the AA perspective, this stage requires “believing in a power greater than oneself and making a decision to alter thinking and actions, as they relate to drinking alcohol”. • Preparation stage: Clients have developed a plan of action and the intention of taking action in the immediate future. By this time the client should have obtained an AA sponsor, and began discussions regarding the first three steps. The plan of action being developed is step four (of 12), “a searching and fearless moral inventory”. • Action stage: Because action is observable, behaviour change is generally equated with some level of action taking place for an average of six months. This time-frame is sufficient for clients to have completed work on AA steps five through nine. • Maintenance stage: The overall goal of the maintenance stage and AA steps 10 through 12 is the continuation of past successful behaviours and remaining within the protective environment of a sober community. Steps 10 to 12 allow clients to “continue taking personal inventory regarding any resentments, harms to others, and so on, along with practicing a spiritual-based recovery life”. Agreeing there is good evidence about the value of mutual aid in 12-step programmes, but feeling that “in an increasingly secular society not all people would feel suited to AA”, Professors Nick Heather and Keith Humphreys developed an alcohol recovery pilot in England based on the principles of peer-led support and SMART Recovery – a programme that makes use of the stages of change model. The final evaluation report can be found in the Effectiveness Bank. ‘SMART Recovery’ (a registered trademark) is supported by an international panel of advisors, including stages of change originator Dr. Carlo DiClemente. Still involved in promoting and developing the application of the transtheoretical model, DiClemente is co-author of a second-edition manual of Group Treatment for Substance Abuse which explains the 10 experiential and behavioural processes or ‘engines of change’, a suite of 17 groups sessions targeted at the early stages of change (precontemplation, contemplation and preparation), and 18 group sessions targeted at people in the later stages (action and maintenance). The stages of change model amounts to a broad guide to what (not) to do with patients at different stages of change. But at the crunch point when it actively engages with change through treatment or brief interventions, research support appears to be largely absent. That is true not just of drug and alcohol problems but of therapy for psychological problems in general. In contrast to other factors, the American Psychological Association could only say matching interventions to stage of change was “probably effective” – and from the relevant review, even “probably” seems optimistic. The most stringent test of stage-matching is to provide exactly the same interventions, but at random to either match or not match these to stage of change. The Cochrane review judged disparities in the findings of such studies “difficult to square with the theoretical model”. Most promising of the studies was one of a model developed from the cycle of change. It found that generally smokers whose computer-generated feedback and advice matched their stage were more likely to progress to the next stage, but offered no direct confirmation that they were more likely to successfully stop smoking. Despite its limitations, there may still be reasons why the cycle of change model remains valuable, though perhaps not in its intended role of helping match interventions to stage of change. In the last paragraph of the Effectiveness Bank review, the author, a cogent critic, finds many ways in which the model might be a positive influence – a kind of benevolent fiction which gives hope to and motivates both worker and client. Likewise a duo including a leading UK researcher on psychosocial approaches to drinking problems declared themselves not yet ready to abandon the cycle of change, though argued that it itself needs to change. They saw the model’s strengths as portraying intentional change as a process rather than a one-off event, the insight that the process is essentially motivational, featuring conflict, ambivalence, vacillation, and regret, and found evidence that the model might progress change through stage-matching, at least in relation to smoking. Find all our relevant Effectiveness Bank analyses by clicking this tailor-made search.